In deciding your wedding flowers, there’s nothing more eco-friendly or practical than choosing locally-grown blooms. Last time, we shared just a few of the beautiful varieties of wildflowers and garden flowers that grow right here in the Adirondacks. In this installment, we offer 9 more gorgeous native flowers for your consideration. Enhance your wedding’s color scheme, or simply use the sentiment behind the flower to add depth and significance to your special event. 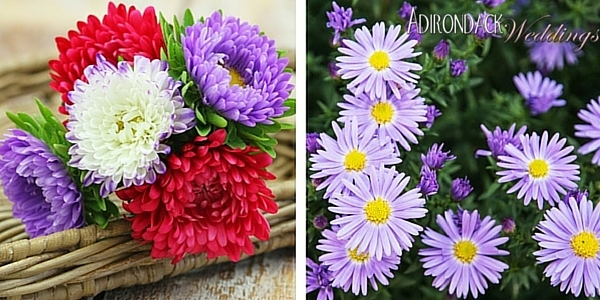 Asters are a beautiful full flower with bright yellow centers that are very versatile in the ways that they can be used, as they would look great in any aspect of wedding flower arrangements. They grow in colors such as white, pink, hot pink, red, as well as different shades of purple. This flower has many meanings, including “patience,” “love of variety,” “elegance” and “daintiness.” These flowers bloom in the late summer and early fall, making them a great choice for August of September weddings. Best used for: Table arrangements, large arrangements, flower girl baskets, etc. Chrysanthemums are another full flower, but they are a little bit smaller in size than some of the other flowers we have here. They grow in a variety of colors including white, yellow, gold, pink, orange, bronze, deep red, maroon, and violet. 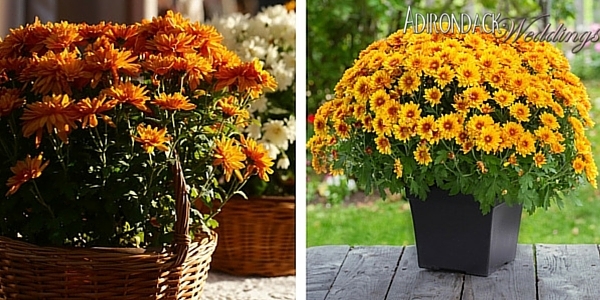 These are flowers that would look great in a fall wedding in the Adirondacks. The meanings for this flower are also a little different, as they have a general meaning, but also meanings according to color. In general, they mean “cheerfulness,” “optimism” and “with love.” Orange chrysanthemums mean “excitement,” while red chrysanthemums mean “love and affection,” and white blooms mean “trueness.” Orange, red and yellow chrysanthemums would look lovely with matching leaves falling from the trees in a late September or early October wedding, especially since these flowers bloom in the early fall. Daylilies are a big, beautiful flower that is very full. 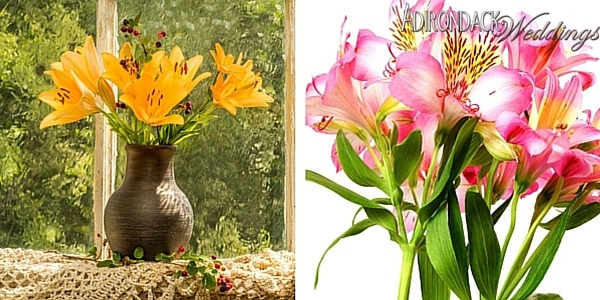 Daylilies grow in a wide variety of colors, including red, orange, yellow, white, pink and purple. The meaning of daylilies is “forgetting worries” and “flirtation.” When daylilies are mentioned, most people think of the big, beautiful orange flowers on the side of a country road, because this is where daylilies are most commonly found. These flowers bloom in late spring and early summer–usually in late May and early June– but they are around for only a few weeks every year, so plan accordingly if these are a must-have for your big day! 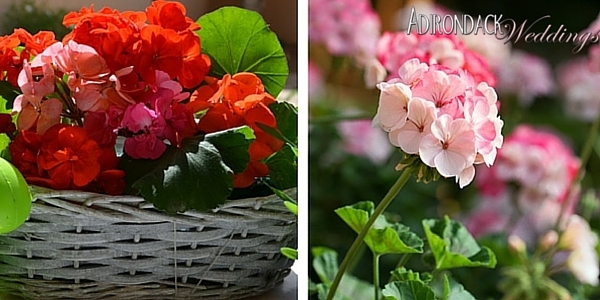 Geraniums are another star-shaped flower that come in a wide variety of colors. These can be found in shades such as white, red, peach, salmon, coral, dark orange, pink, and purple. Geraniums mean “comfort,” so this is an appropriate flower to use in an area where you will be together with your friends and family. Geraniums bloom when there is a lot of sun during the day, but since it gets cooler at night, these flowers bloom most often in late spring to very early summer. Hostas have almost a bell-like shape, though their petals also make a star shape. They can be found in colors such as blue, green yellow and white. Being relatively small flowers, they would serve as an ideal filler with other types of flowers. 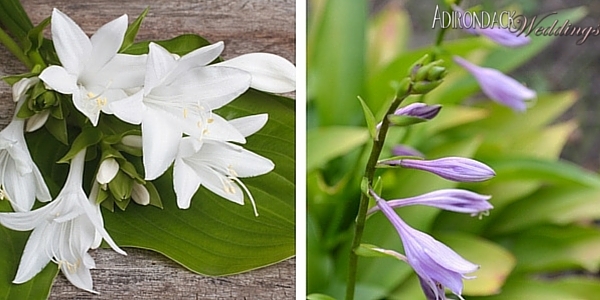 The meaning of hostas is “devotion,” so this is another flower that could be very symbolic for your wedding day. Be careful with these blooms if you plan to include your furry friends in your wedding–they are toxic to dogs, cats, and horses. Best used for: Bouquets, boutonnieres, corsages, table arrangements, etc. This beautiful classic flower grows in colors such as blue, purple, white, yellow, pink, and orange. 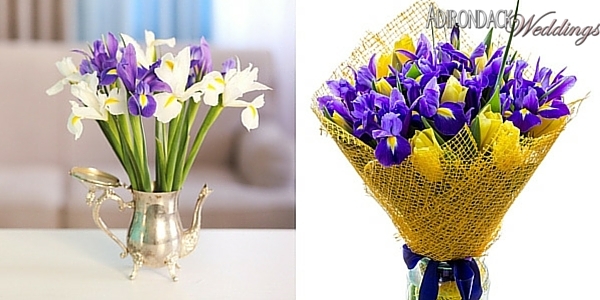 Irises are another flower that have great meanings that tie in perfectly with weddings: “wisdom,” “promise of love,” and “hope.” These flowers would pair wonderfully with a bright pop of yellow or gold if you are planning to use the more traditional blue or purple variety on your big day. Adirondack Weddings Magazine has featured lavender before, and it’s because we love it so much. 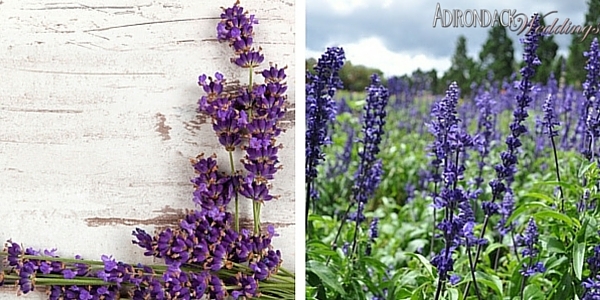 Lavender can be found in varying shades of purple from almost white to a very rich, deep purple. Lavender means “love,” as well as “devotion,” so it’s no wonder that this flower is perfect for weddings. As seen in Volume 4 of the print magazine, lavender looks beautiful as the main focus of a bouquet, but it also looks lovely as a filler flower. Dwarf sunflowers are a smaller variety of the normally very large sunflower. They grow in the traditional sunshine yellow, as well as gold, orange, red, bronze, and white. 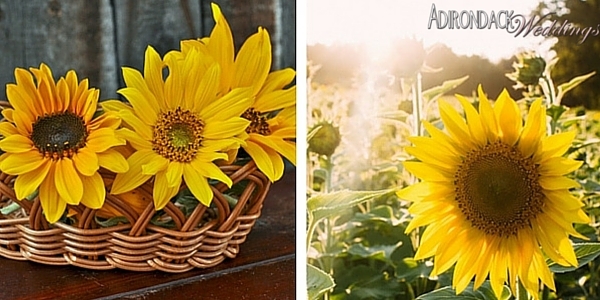 Sunflowers mean “adoration,” so they would make a lovely addition to any wedding. Sunflowers bloom in the summer when there is the most sun, so July and August weddings would be the perfect time to use these beautiful blooms. Violets are another small and uncommon flower that would make a unique addition to any wedding flower arrangement. 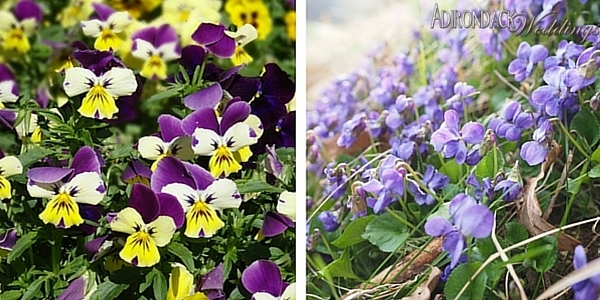 Violets are also very dainty flowers, and keeping them in soil helps to keep them from wilting. They grow in colors such as purple, blue, yellow, and white, and they can sometimes be more than one of these colors. This is another flower that has different meanings for different colors. In general, violets mean “modesty,” “virtue,” and “affection.” Blue specifically means “faithfulness,” and “love,” and white specifically means “let’s take a chance on happiness.” Violets are spring flowers, so keep that in mind when planning your wedding if they are a favorite of yours. Whether showcasing one native flower or dozens, your flower arrangements are a colorful opportunity to display local pride. Trends may come and go, but incorporating natural elements into your Adirondack wedding will never go out of style.